All 4th and 5th graders are given web spaces to create, and curate, their own digital portfolios. These sites are built, and maintained, by the students using Google Sites. These sites are initially only visible to the student and their teacher. The goal of student portfolio sites is to give students a space to develop on their own, creating their own digital presence and self-directed portfolio, that they can then use throughout their years in Scarsdale. This website stays with them as long as they are students in Scarsdale, and can eventually be transferred to a personal account so students can keep, forever, a catalog of all the work they are proud of. A blueprint for a website is a site map. 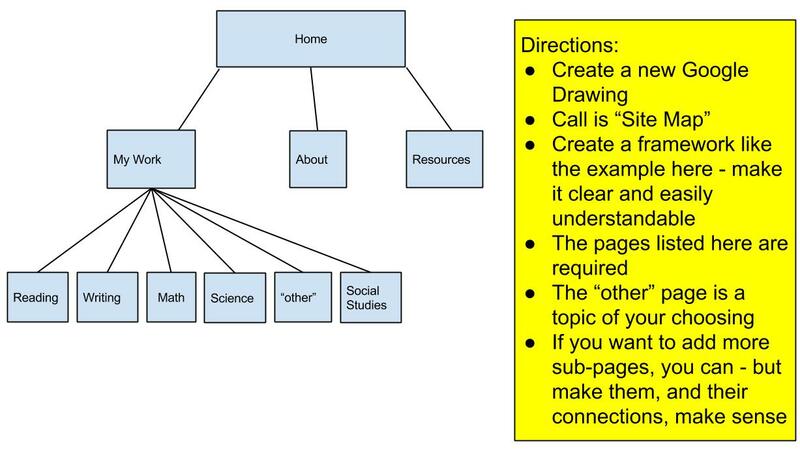 Students use Google Drawing, a part of Google Drive, to create a site map, a blueprint for how their website will be built and how each page will connect and interact with others. As time goes on, the site map will be the space for students to conceptually design their layout and flow before doing any live programming. The initial pages are required and act as a framework for the portfolio. 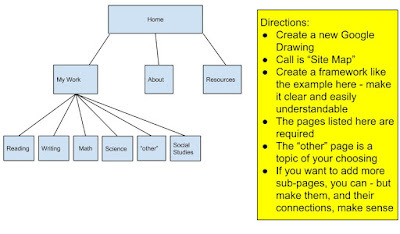 As time goes on students will be able to add pages of their choosing, and choose the content they populate it with, all the while using this initial site map as a guide for structure.